In 1961, the Buffalo Bills of the American Football League and the National Football League’s Dallas Cowboys banged heads during the off season by picking the same player in their annual drafts. Billy Shaw of Georgia Tech. As a Yellow Jacket, Shaw played tackle and enjoyed an exceptional career. A three-year letterman, he also won All-American honors and by his senior year, a number of teams in both leagues were trying to sign him to a contract. Fortunately for the Bills, Shaw decided to play pro ball in Western New York rather than in Texas. A second-round pick, Shaw was converted from tackle to guard by the Bills. It was one of the wisest personnel changes ever made by Buffalo. Shaw quickly learned his new position and excelled at it. At 6-2 and 258 pounds, he played every down with the enthusiasm of a rookie. His teammates remember him as an intense and intelligent player who gave 150 percent effort every down. Tough and quick, he earned the respect of defenders throughout the league with his bone-crunching hits as a pass blocker or when leading power sweeps. Playing between Al Bemiller at center and Stew Barber at tackle, Shaw became part of one of the most fearsome offensive fronts of the era. For six years, Shaw served as co-captain of the Bills, but he was never a cheerleader. Instead, he motivated and led his team with his tough, intense play. He led by example. A test of his courage and toughness came during the 1967 season when he suffered a serious knee injury. Shaw fought back and eventually was able to continue an outstanding career. 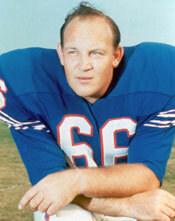 Today, Billy Shaw is still considered one of the best offensive lineman ever. His 1999 induction into the Pro Football Hall of Fame in Canton, Ohio only exemplifies this.